Oh wonderful olde-timey pie-crusader! Ye have stumbled upon a misadventure so grand, you are toying with our reason and logic. Time-shifting, reality-bending, little pie puzzles, we LOVE you! If you're not quite sure of what game I'm referring to, why it's none other than The Misadventures of PB Winterbottom available now for the Xbox Live Arcade for a mere 800 points ($10.00). 2K Play has sent us a copy to review, and to encourage you to check out this wonderfully unique title. The game-play resembles one of the worlds in Braid (if you've never played that one, you are doing yourself a disservice my friends). You control P.B. Winterbottom, on a quest through over 75 levels of pie collecting. This isn't just any platformer though, my friends. With the help of your clones, and your ability to manipulate the time-space continuum. As Ricky Ricardo once said to Lucy, "Lucy Mashbuttons, you got some 'splainin' to do!". You see, in each level, you have to gather all of the pies (sometimes in specific order, no less); and you have a limited number of clones at your disposal. As you play, you hold down the right trigger (RT), and the game "records" your actions. After you've recorded, you have full control over your own character, but your clone that you recorded continues the same actions you laid out for it to record. Continuing in a loop, you use your own self, and your clone(s) to gather all of the pies. The early levels are meant as a training-ground, but soon you're thrust into levels where you'll spend some good time figuring out how to tackle all the pies. Some levels are devilishly hard, and others are easy, but all are logical, creating a sense of accomplishment when you have that "ah-ha" moment to beat the level. Outside of the standard game, you unlock challenges where you have a certain goal that you're working for. Like a time-trial, you record your best time, etc and onto the Xbox Live leaderboards you'll go. It's a great way to continue playing the game long after you've finished the main story. 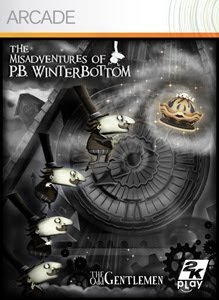 Mashbuttons gives The Misadventures of PB Winterbottom, a 9 out of 10. An innovative title, elegantly executed.